Saint Lucia Prime Minister, the Hon. 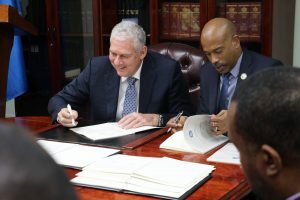 Allen Chastanet and CDF Chief Executive Officer Rodinald Soomer sign the agreement. 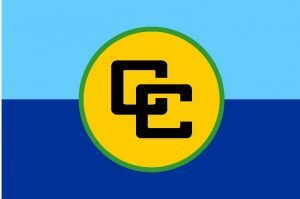 US$332,800 (EC$898,560) for the development of a revised National Export Development Strategy for Saint Lucia, coordinated by the Trade Export Promotion Agency (TEPA) to strengthen the export capability of the Member State. US$120,000 (EC$324,000) to establish the institutional framework and roadmap for Village Tourism, coupled with the provision of business development support to Small and Medium Sized Enterprises (SMEs) to enhance their capacity to provide goods and services for the Village Tourism market. These agreements constitute the first tranche of support being provided to St. Lucia during the CDF’s Second Funding Cycle (2015-2020), and will form part of a broader Country Assistance Programme (CAP) intended to deliver benefits to the member state through targeted initiatives in investment, export promotion and enterprise competitiveness. During the CDF’s First Funding Cycle, Saint Lucia received US$6.2 million (EC$16.7 million) in support in the form of three grants and a concessionary loan to finance programmes for export promotion, youth agri-entrepreneurship, energy efficiency and SME development.